Notes: 3D+2D region free discs. 3D disc is worldwide edition. 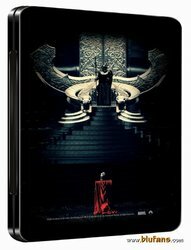 WEA embossed front steelbook with WEA full height lenticular slip cover. Includes 4 postcards similar to IM finish. There's already a thread for this isn't there? As with Cap Am, the HMV steelie is more than enough for me. What is the point we already have enough thor and capt america steelbooks? Is someone able to explain these releases ? 2D only? or is that just the slip? Needs to come with a free mug that says "This Drink, I Like it! ANOTHER!" Stand corrected, I meant double not combo pack like Star Trek tripack. Sorry. Same as captain America, they have to be better than the HMV versions. Will be hard to do better than Kimchi. Yep that's already a brilliant steelbook, they need to at least match that and bring a really nice slip to the party. Blufans seem to be going into overdrive with all these recent steels being announced. Not really interested in owning more Thors or Captain Americas. Maybe they are trying to kick off their international webstore w/a bang! I'm not expecting so. I'm guessing at the Asia steel with a full slip with some embossing.